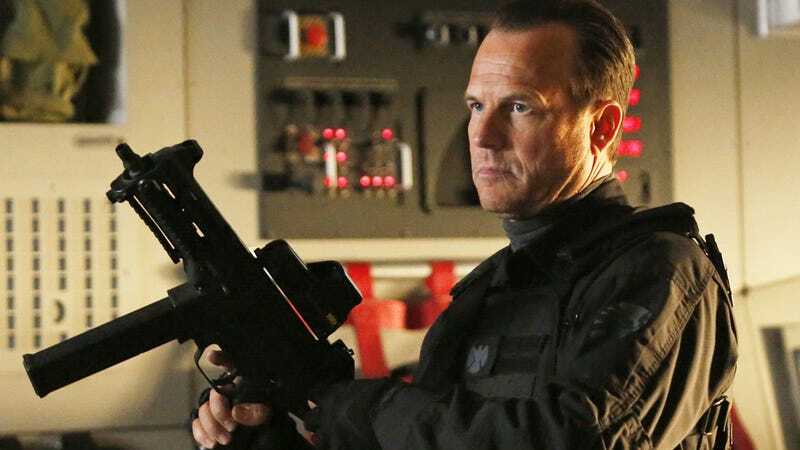 Are the Agents of SHIELD actually supposed to be the good guys? Last night's episode of Agents of SHIELD was sort of weird. Like, tonally weird. I wasn't sure what I was supposed to be feeling — until the end, which was pleasingly creeptastic and jacked up. Most of all, I was wondering if these guys are really supposed to be heroes, given how they behave. So the main plot of "TAHITI" revolves around saving Skye from her fatal bullet wounds, inflicted in the previous episode. And saving Skye, in turn, requires figuring out how Coulson was really brought back from the dead. We already saw the weird surgery they did on Coulson's brain and the tons of procedures they performed to resuscitate him, but now it turns out there was some miracle drug that restored his perforated heart. And that miracle drug turns out to be the product of a weird creature kept in a tank with tubes coming out of it, in the basement of a secret facility in the middle of nowhere. This creature is so weird and exploited, seeing it freaks out Coulson to the point where he suddenly decides it's not a good idea to inject Skye with the miracle drug after all. The weird creature is a neat moment, and definitely lends a bit of insane gravitas to this episode — plus score yet another notch on the "SHIELD is an evil organization" side of the ledger. But like I said, this episode is tonally weird. Like, the story is supposed to be about our heroes getting pushed to their limits by grief, to the point where they go off the rails and do something crazy to save Skye. It should be full of misery and desperation — but after a somewhat sad opening, the actual tone of the rest of the episode is laid-back, jocular and even breezy. Mostly, this is because the show somehow managed to score Bill Paxton as a recurring guest star, playing Agent John Garrett, and Paxton brings such a friendly, easy-going vibe that everybody else just falls into it. The end result of this is that we wind up watching Coulson's team acting in an utterly unconscionable manner, while seeming kind of mellow and happy about it — it's hard to reconcile their actions with the tone of this episode. What are the non-heroic things in this episode? It's not just that Melinda May goes into the interrogation room and beats Ian Quinn to a bloody pulp — it's that nobody seems to think that was crossing a line. There's even a weird scene where Grant Ward tells Melinda that he liked seeing her brutalize an unarmed, immobilized man, because she doesn't show her emotions that often. And I guess any show of emotion, however brutal and inappropriate, is better than just acting in a professional manner. I know Quinn shot Skye, but that doesn't excuse violating the Geneva Convention on him. That's just weird. So Garrett shows up with three planes, because Coulson was supposed to hand Quinn over to SHIELD for interrogation. But once Coulson tells Garrett that he has a dying agent on board, and they're rushing to try and save her, Garrett totally changes his tune and decides to go along for the ride — because of course, if Skye dies, Coulson will be totally justified in murdering his prisoner. That just goes without saying. Of course, at the end of the episode, Coulson tries to pretend he never said he would throw Quinn out of the plane if Skye died. But he and Garrett share a knowing look when Garrett agrees to let Coulson keep Quinn. And there's no other reason to keep Quinn on Coulson's plane. Even apart from the morality of murdering an unarmed prisoner in cold blood — doing what Quinn did to Skye — there's also the stupidity of killing a valuable source of intel. If Coulson had some plot-related reason for wanting to keep Quinn, that would be one thing. But he literally just hangs on to Quinn so he can possibly take revenge. But then Garrett decides he can interrogate Quinn on board Coulson's jet — something he does kind of a bad job of. Like, Quinn starts telling them about Deathlok, and they don't follow up on it at all. But also, Garrett makes a big deal of telling Quinn he has no rights and no lawyer, and they can rip his tongue out and stuff. The threats of torture may be idle ones, but they still haven't disciplined the agent who beat up this same prisoner, and Garrett seems pretty excited about the idea of torturing his prisoner. This is sort of the crux of the episode. The Clairvoyant really, really wants toknow how Coulson came back from the dead — so much so, that he kidnapped and tortured Coulson a while back. This is supposedly the one piece of information the Clairvoyant can't simply see. And Quinn comes out and admits that he shot Skye to force Coulson to dig into the mechanics of his own resurrection — so Coulson is playing into the Clairvoyant's hands with his mission to save Skye. Nobody stops to consider that saving Skye's life could wind up causing thousands or millions more deaths down the line. Maybe I missed it in all the excitement, but does anybody comment on this at all? Those soldiers that Coulson, Garrett and the others slaughter are not enemy combatants — they're SHIELD's own people. Or at least, they're connected to SHIELD. They are just trying to guard a facility that Coulson doesn't have authorization to get inside. And Garrett seems downright gleeful about doing this the hard way, letting his gun speak for him. Not to mention, when the facility is blown up in a final failsafe, there's no guarantee it was totally empty apart from those two guards. Coulson is willing tomurder two of his own people in cold blood to save Skye's life. On the plus side though, I really like Agent Triplett (BJ Britt) and hope he and Simmons do get together — their scenes together were really cute.